14.2. How to Create a New Module? There are at least two ways of creating a new module in your website. The first way is copying an existing module from APP_DIR/module directory (such as Application module), removing any unnecessary controllers, models and views, and renaming the existing namespace into your module name in every source file. This may be rather boring. The second way is downloading an empty skeleton module from the official Zend Framework repository on GitHub. You can find this repository by this link. You can clone the code or download the code as a ZIP archive (recommended). The commands above download the source of the skeleton module to your home directory, unpack the archive and copy the files to your website's module directory. config subdirectory contains module.config.php file which is the configuration file for this module. Controller subdirectory contains a sample controller class. Module.php file is the module entry point. We will discuss it a bit later. tests subdirectory contains a stub for unit tests for this module. We do not cover unit tests in this book for simplicity. view subdirectory contains view scripts (and also may contain module-specific layout templates). Before you can use this new empty module, you should choose a name for it. A good name describes the module well. For example, the name Admin is good when you need a module for backend stuff. Blog name would be good if you plan to store blog functionality in this module. A good practice is also prepending some vendor name to the module name, for example YourCompanyBlog. Next, you should rename the SkeletonController.php into something more descriptive. Don't forget to rename subdirectories of view directory to reflect the name of the controller. 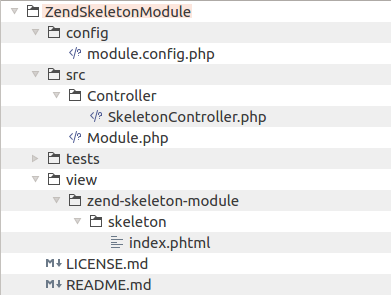 Finally, walk through configuration and source files of the controller and make sure you renamed the namespace ZendSkeletonModule to the name of your module (this is required to ensure your classes will be found by PHP class autoloader). The dump-autoload command just regenerates autoloader code without installing or updating any dependencies. Great! The module is now ready for use. You can add controllers, models and views into it. Do not forget to modify the module.config.php file and register your routes, services, controllers, controller plugins, view helpers, etc.